Prior to 1946, botanists believed there were just two subspecies of Calystegia macrostegia in mainland Southern California: ssp. cyclostegia and ssp. arida, segregated mainly on the shape of the bractlets immediately below the flowers. In 1946, Abrams created three new "taxa" out of ssp. arida based on herbage hairiness, with sspp. "intermedia", "longiloba" and "tenuifolia" being glabrous or nearly so, and leaving a more strictly-defined ssp. arida being cinereous with dense tomentulose puberulence. The three new "taxa" were distinguished from each other on the shape and width of the middle lobe of the leaves. One of those new "taxa", ssp. "longiloba", was deleted in the 1993 Jepson Manual treatment, considered not to be different from ssp. "intermedia", leaving three "taxa" created out of the former ssp. arida: sspp. "intermedia", "tenuifolia" and the newly strictly-defined ssp. arida. I have always been somewhat confused about these three "taxa". I have observed a range of hairiness that is a continuum, with only a small percentage of plants hairy enough to be called the more strictly-defined ssp. arida. Those plants have never exhibited any geographic correlation; they appear as isolated individuals amidst an ocean of the other two "taxa". The other two "taxa" also show no geographic correlation themselves. A single clear plant of "intermedia" can pop up in the midst of a sea of "tenuifolia", and vice versa. For each of my plant trail guides, I record the location of the first occurrence of every taxon, and hence repeatedly survey a given specimen in the field from year to year. Disturbingly, the first specimen of C. macrostegia on several trails at the Santa Rosa Plateau Ecological Reserve seemed to change its taxon from year to year in terms of hairiness and in the shape of the leaf. In 2005 and 2006, much to my surprise, two specimens, one in Fallbrook and one at the Santa Margarita Ecological Reserve (SMER), completely changed the shape and width of the middle lobe of the leaves, one switching from a very clear ssp. "tenuifolia" prior to 2005 to a very clear ssp. "intermedia" in 2005 and back to ssp. "tenuifolia" in 2006, and the other one switching from a very clear ssp. "intermedia" in 2005 to a very clear ssp. "tenuifolia" in 2006. Both kept their pubescence the same; one plant was sparsely pubescent, the other was pubescent. The 2005 form of the SMER plant, appearing as a clear specimen of ssp. "intermedia"
The 2006 form of the SMER plant, appearing as a clear specimen of ssp. "tenuifolia"
The year 2005 was a near-record rainfall year in Southern California. Both the Fallbrook and SMER specimens showed the large leaves with wide middle lobes of ssp. "intermedia" during the heavy rainfall period of 2005, and the small leaves with narrow middle lobes of ssp. "tenuifolia" outside of that heavy rainfall period. In fact, I have observed several places where ssp. "intermedia" is intermingled with ssp. "tenuifolia" in a given area, with ssp. "intermedia" found only in the wetter areas in that area. Even in normal rainfall years, there is a clear trend for ssp. "intermedia" to be determined in the wet months of February - April; for ssp. "tenuifolia" to be determined in the dry months of April - November; and for ssp. arida to be determined in April - June, when plants probably have both types of leaves on them. Furthermore, the Plant Atlas data show there is no difference in the geographic ranges of these putative taxa. These three independent sets of observations clearly show that sspp. "intermedia" and "tenuifolia" are bogus taxa, and simply represent the extremes in terms of pubescence and leaf width in ssp. arida. Leaf size and width are clearly dependent primarily on moisture available to a given plant. B. glutinosa, which flowered April - October with heads in a cymose panicle at apex of stem; lvs usually toothed. The discriminants above are those from the (red) Munz 1959 key. In the early 1970s, Dieter Wilken was botanizing the Millard Canyon Trail in the foothills of the San Gabriel Mountains and happened to notice that a plant which he had previously identified as one of the species had turned into the other species! Generally, B. viminea is recognized as a separate sp. by having laterally placed cymes, but there is some evidence (presented by D.H. Wilken) that the terminal corymbose infl. of B. glutinosa comes first and the side branches may develop later. It was entirely reasonable that Munz felt compelled to add this note about why he had merged the two species, to explain it to botanists who held firmly onto the two bogus species. But it is curious that although Wilken gave Munz solid evidence of a plant that would be classified as both bogus species, depending on time of year, Munz reported it as only some evidence. Munz was clearly not entirely happy himself with this merger! I love this story because it shows how one can be misled if one only looks at herbarium specimens. (Don't misunderstand me; herbarium specimens are vitally important; they just need to be supplemented with fieldwork.) I also love this story because it shows how difficult it is for botanists to give up species with which they are familiar, no matter how bogus they may be. I never thought I'd have the chance to find something similar, assuming that such feats were possible only in the days of yore, and surely modern floras would not have anything similarly bogus in them. But I was wrong! I've discovered not just one, but two smoking guns that show that sspp. "intermedia" and "tenuifolia" are bogus taxa. The first smoking gun just dropped into my lap while I was doing other fieldwork, showing the importance of continued fieldwork. The second smoking gun came from a herbarium study, the San Diego County Plant Atlas, with the discovery made possible by the easy access to the digital data over the web. Prior to 1946, botanists believed there were just two subspecies of Calystegia macrostegia in mainland Southern California: ssp. cyclostegia and ssp. arida. Both of these taxa were considered to be species then under a different genus name, Convolvulus cyclostegius and C. aridus, segregated mainly on the shape of the bractlets immediately below the flowers. As is normally the case for valid taxa, these two subspecies have distinct geographic ranges: ssp. cyclostegia is found near the coast, and ssp. arida is found in interior Southern California away from the coast. In 1946, Abrams defined three new "taxa" as subspecies of Convolvulus aridus based on herbage hairiness. 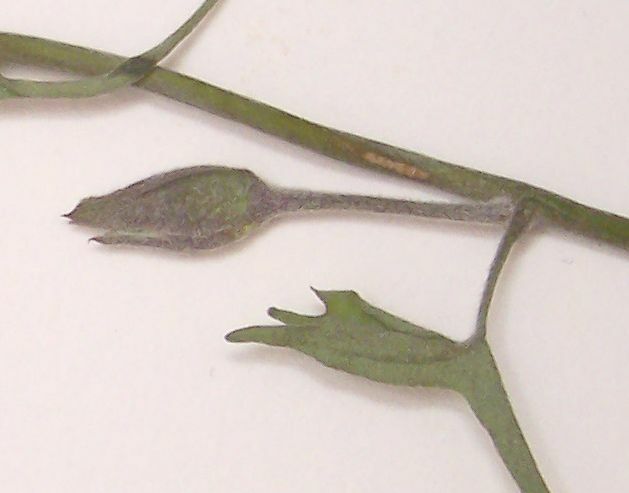 The three new "taxa" were distinguished from each other on leaf shape, and, along with the Abrams-redefined Convolvulus aridus ssp. aridus, became coequal subspecies of Calystegia macrostegia when they were switched to that genus. Middle lobes of lvs. narrowly linear; corolla 2-2.5 cm long. W. Riverside Co. to n. L. Calif. .... ssp. "tenuifolia"
Basal lobes of lvs. less than half as long as middle lobe, not strongly divergent. Ventura to Orange Co.; Catalina Id. .... ssp. "intermedia"
Basal lobes of lvs. at least half as long as middle lobe, strongly divergent. Dry hills about San Diego and to w. Riverside Co. and e. Orange Co. ... ssp. "longiloba"
s.l. stands for sensu lato = in the larger, more inclusive sense, in this case referring to ssp. arida prior to the split of the other "taxa" from it; s.s. stands for sensu stricto = in the narrower, more restrictive sense, in this case referring to ssp. arida after the split. As can be seen from the key, using the vouchers available to Abrams and to Munz by 1974, these four new "taxa" appeared to have the expected separate geographic ranges. The treatment by Brummitt in the 1993 Jepson Manual, following Brummitt (1980), removed ssp. "longiloba", considering that to not be separate from ssp. "intermedia". Curiously, Brummitt also changed the key to discriminate ssp. arida, demanding that it be densely short-hairy (hairs visible to the eye), as opposed to the Munz criteria of dense tomentulose puberulence. Brummitt allowed the other two new Abrams "taxa" to be glabrous to puberulent, encompassing many more specimens than the lvs. and stems glabrous or nearly so of Munz. Brummitt furthermore removed the discrimination using corolla length in the Munz key; all the new "taxa" now were reported to have similar corolla lengths. For example, for ssp. "tenuifolia", instead of the corolla 2-2.5 cm long in Munz, Brummitt reported it as 22-40 mm long, completely negating the supposed discrimination from the other two new "taxa" which supposedly had corolla 3-3.5 cm long. The only area that is said to have just ssp. arida is SnBr, where Sanders and Krantz report it is "uncommon", present only on the "lowermost slopes". I suspect collection of a few more vouchers would produce some ssp. "intermedia" and some ssp. "tenuifolia" there as well. The only area that is said to just have ssp. "intermedia" is the "s WTR"; again this is so narrow that it sounds like a "few voucher" area. The only area that just has "tenuifolia" is "c&s SCoR", which seems a bit suspicious, too, since ssp. 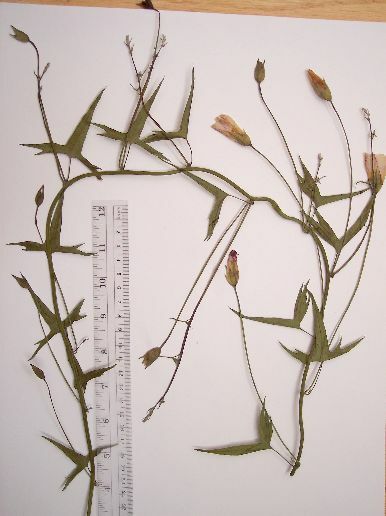 "tenuifolia" was originally considered mostly as being in San Diego County and nearby areas. Finally, the Jepson Manual reports that all of these new "taxa" intergrade. This is a botanical code word that means that many specimens in the field can't be identified clearly with a single taxon. As far as I know, there is no evidence at all that the species actually intergrade. Intergradation can come about in two ways. First, taxa with valid subspecies that have separate geographic ranges will often have intergrades in a well-defined small geographic region that is exactly at the overlap between the ranges of two subspecies. Second, bogus taxa always produce such "intergrades", because the taxa don't actually exist. If the real taxon has a continuous variation in, for example, pubescence, but one defines taxa to represent the ends of the variation, then necessarily there will be many "intergrades". However, the presence of intermediate specimens is not proof of an "intergrade" in this case, since the "taxa" are fictional. There are many examples of such bogus taxa given in Munz that were discarded in the Jepson Manual. The only separation between the remaining "taxa" is based on characteristics of pubescence and leaf shape that quite frequently vary within many other species. These don't sound like valid taxa, do they? Of course, I wrote the above after discovering in the field that these "taxa" are bogus. Hindsight is always very clear! My observations are presented in chronological order for two reasons. First, it shows that I didn't set out on any agenda to declare these "taxa" bogus. On the contrary, for years, I've simply been attempting to find and understand them. Second, it details the process of enlightenment here, for those curious as to how science is often done. As many famous scientists are quick to point out, scientists almost never follow what is taught in schools as the "scientific method". Instead, most science begins with a simple observation of That's funny...". In most of my short botanical career, from 2002-2004, in north San Diego County and surrounding areas, including the Santa Rosa Plateau, most of the C. macrostegia plants I saw were clearly ssp. "tenuifolia", with glabrous or near-glabrous leaves with extremely narrow middle lobes. (In retrospect, it turns out that the preponderance of leaves with narrow lobes was mostly due to those being drought years, but I didn't know that at the time.) However, I did notice that the hairiness of the leaves varied considerably in a single plant depending on time of year. Observing clear ssp. "tenuifolia" at the Santa Rosa Plateau puzzled me quite a bit, since Lathrop and Thorne had called the plants there ssp. arida. Yet there was nothing remotely like lvs. and stems cinereous with dense tomentulose puberulence for those plants. Hence for some years now I have intensely examined every specimen of C. macrostegia that I have come across, in search of the elusive ssp. arida. I finally came across a single plant that clearly had cinereous leaves in the San Marcos Hills in spring 2003. It was a young plant, not blooming yet, so its leaves may have been hairer than they would have been later in the year. Nonetheless, I was ecstatic to finally see a specimen that might possibly be a ssp. arida. Also in 2003, I began to see ssp. "intermedia" at the Santa Rosa Plateau, with those plants seemingly randomly mixed in with ssp. "tenuifolia" there. (2002 was the severe drought year; 2003 was a normal-rainfall year. Although it seemed to me at the time that these sspp. were randomly mixed, it actually turned out that the ssp. "intermedia" were preferentially found in moister locations.) Furthermore, the pubescence on the ssp. "tenuifolia" "taxa" on the trail became much heavier in the fall, so I started calling those plants a ssp. "tenuifolia / arida intergrade". Clearly, things were getting messy and confusing. The more data I accumulated, the less clear everything seemed to be. I've since learned that this is almost always a symptom of bogus taxa. The leaves are both the same, with hairs just visible to the naked eye, about 1/3 mm long, making the lvs gray-green. I'd call the lvs hairy, not densely, not sparsely. And looking at the Jepson Manual illustration for ssp. arida, that's about the denseness I see. Now, oddly, Banks (who did the flora of this area) has ssp. "tenuifolia" as the only common Calystegia, and the only one in this area. So now I've got ssp. arida instead of ssp. "tenuifolia" at Dripping Springs, and ssp. "tenuifolia" instead of Lathrop and Thorne's arida at the Santa Rosa Plateau. Clearly, these "taxa" are pretty darn close, due to the small difference between puberulent and short-hairy. And I think the hairiness varies as a function of time during the year, with the new lvs being short-hairy and the older leaves becoming glabrous, which is what I've found at the Santa Rosa Plateau. So maybe these aren't even separate sspp.... that would explain a lot! Despite that prescient speculation, I continued to try to understand how other botanists delineated ssp. arida. In early 2005, I finally began seeing plants that could correspond to ssp. arida at the Santa Rosa Plateau. They were popping up all over, which seemed extremely curious to me after never seeing these in previous years. Although in one sense I was pleased to finally see specimens that corresponded to what Lathrop and Thorne had found, I was deeply disturbed to now have three subspecies at the Santa Rosa Plateau. This made no sense at all unless somehow the Santa Rosa Plateau was a magic meeting ground of the geographic ranges for the individual taxa. But with my background as an astronomer, I am very loath to call any given place as special for such things, since it is practically a bedrock principle of astronomy that no place in the universe is special. In botany, I have all too often found that claims that a given spot is special in such a way usually indicate there is something wrong with the floras, instead of that spot being special. Then I got one of the biggest botanical surprises I've seen. I have a native (not planted) C. macrostegia specimen almost right outside my bedroom window at my house in Fallbrook, north San Diego County. This specimen had been a clear ssp. "tenuifolia" for many years previously, with very narrow middle leaf lobes, green stems and leaves, and no hairs visible to the eye. But when I looked at it in April 2005, the plant had become a very clear ssp. "intermedia", with extremely wide middle leaf lobes!!! I was simply stunned; the answer had dropped into my lap; the subspecies were clearly bogus. I vouchered this plant, and looked forward to vouchering it again when it turned back into a ssp. "tenuifolia", which it has done in 2006, although it hasn't bloomed yet (as of 23 January 2006). Using the vouchers, I was able to verify what the heck the hairiness of ssp. arida is supposed to be (such as it is, simply white-puberulent on the stems and pedicels, which is very different from the "densely short-hairy" of the Jepson Manual). The result is that I'm now classifying the plant in my yard as ssp. arida. However, the subspecies are clearly not well-separated. I found two vouchers by Jon Rebman that looked mostly identical to me, #6018 (determined by Jon as ssp. arida) and #6503 (determined by Jon as ssp. "intermedia"). At most, the ssp. arida voucher was only a wee bit hairier than the ssp. "intermedia" voucher. These two vouchers by Rebman were especially enlightening. When an expert botanist such as Jon has to literally "split hairs" in order to make a decision about which taxon a given specimen is, it calls into question whether the "taxa" actually are separate. However, it was premature for me to claim that ssp. "intermedia" and ssp. "tenuifolia" were bogus, since the plant in my yard that changed species could possibly be explained as being ssp. arida. Finally, on 21 January 2006, while vouchering plants from the Santa Margarita Ecological Reserve for the San Diego County Plant Atlas, I came across the smoking gun that incontrovertibly shows that ssp. "intermedia" and ssp. "tenuifolia" are bogus. By dumb luck, a plant I had vouchered from 4/15/05, and called a clear ssp. "intermedia", had become a clear ssp. "tenuifolia". This plant is far from any plant ever called ssp. arida in the San Diego Natural History Museum vouchers. This plant, in each of its "forms", is never more than "sparsely puberulent". Width of middle lobe of leaf at top, for leaves at least reasonably mature, is 2.0-5.5 mm, tapering quickly to a very narrow acute tip. However, it is so narrow that this lobe could be reasonably called "+- linear", as does the Jepson Manual key for ssp. "tenuifolia". Upper lobes are entire to 2-lobed. 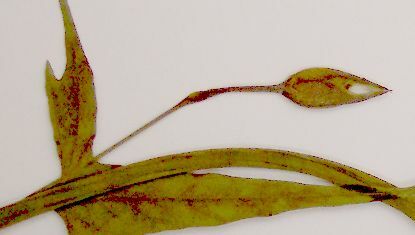 The stem, mature pedicel, mature petiole and leaf blade are all sparsely puberulent at best; only the very base of the petiole is densely white-puberulent. This would have to be called ssp. "tenuifolia", based on the floras and the vouchers at the San Diego Natural History Museum.. This gps position is 16 feet away from the first one, well within the expected repetition accuracy of GPS coordinates. Furthermore, there is only a single plant at this location or anywhere near it, so there is no possibility of confusing one plant with another. Width of middle lobe of leaf at top, for leaves at least reasonably mature, is 9.0-12.0 mm, tapering slowly to a very narrow acute tip. this lobe is very clearly triangular. This would have to be called ssp. "intermedia", based on the floras and the vouchers at the San Diego Natural History Museum. Of course, since these vouchers are of the same plant, they cannot be assigned to two different subspecies. Unlike the plant in my yard which switched leaf sizes, there is no way to call this specimen ssp. arida and retain the other two subspecies as being distinct from ssp. arida. This plant is direct evidence that ssp. "tenuifolia" and ssp. "intermedia" are not distinct taxa, but are environmentally produced by the available moisture. In the above pictures, the first two sets are shown at the same relative size. The dramatic difference in leaf size and shape is quite obvious. The last two sets have been blown up and enhanced to show the hairs as much as possible. As detailed above, hairs are hard to find on most of the stem, mature pedicel, mature petiole and mature leaf blade for both vouchers. However, the young buds and young petioles clearly show the dense white-pubescence of those immature parts. The last two sets of pictures are not necessarily shown at the same relative size. By the way, I have never found specimens of these three "taxa" to have consistent characteristics for the outer leaf lobes. The Jepson Manual treatment says that ssp. "tenuifolia" has lobes linear, but I have seen plenty of two-lobed upper lobes, as in the plant above. I've found the same contradictions for ssp. arida. I quickly realized that this plant, and the plant from my yard, had undergone the same transformation; in the heavy-rainfall 2005 rainy season, the plants produced the big leaves, with wide middle lobes, of ssp. 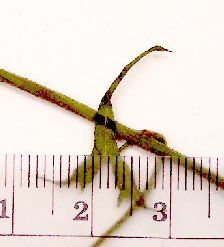 "intermedia", but in drier conditions, they produced the small leaves, with narrow middle lobes, of ssp. "tenuifolia". On the South Santa Margarita River Trail in Fallbrook, ssp. "tenuifolia" is found in the drier, more open parts of the trail, and ssp. "intermedia" is found in the wetter areas of the trail, such as in one quite-wet side-drainage filled with much lusher growth than it typical on the south bank. On the Vernal Pool Trail at the Santa Rosa Plateau, ssp. 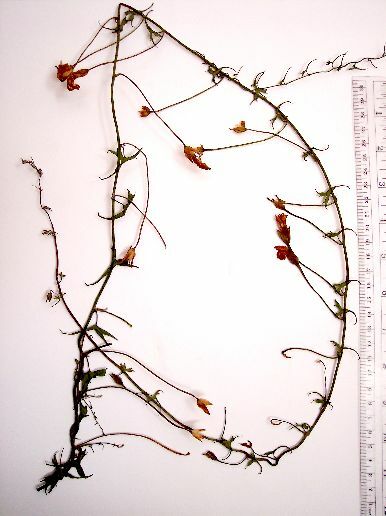 "tenuifolia" is found in the open, drier mesa, and ssp. "intermedia" is found just below the mesa, on the shaded north-facing slope. Thus there is abundant evidence that wetter conditions produce ssp. "intermedia" and drier conditions produce ssp. "tenuifolia". This is also probably why ssp. "tenuifolia" was mainly found in cismontane San Diego County, simply because San Diego County is drier than areas to the north. By the way, the bogus subspecies of Eriogonum inflatum followed precisely this same pattern: ssp. "deflatum" was primarily found in the drier DSon, with ssp. "inflatum" found in the wetter DMoj. These subspecies have been now shown to also be environmentally-induced by the amount of available moisture. This realization that these C. macrostegia sspp. are due to moisture conditions led to the next investigation to see if I could quantify this from the San Diego County Plant Atlas. If the heavy rainfall in the 2004-2005 rainfall season produced plants that corresponded to ssp. "intermedia" in the North San Diego County area, I surmised it was probably true in other areas as well. I immediately thought of the San Diego County Plant Atlas, a project to voucher plants from each of 479 3 mile by 3 mile grid cells that cover San Diego County. 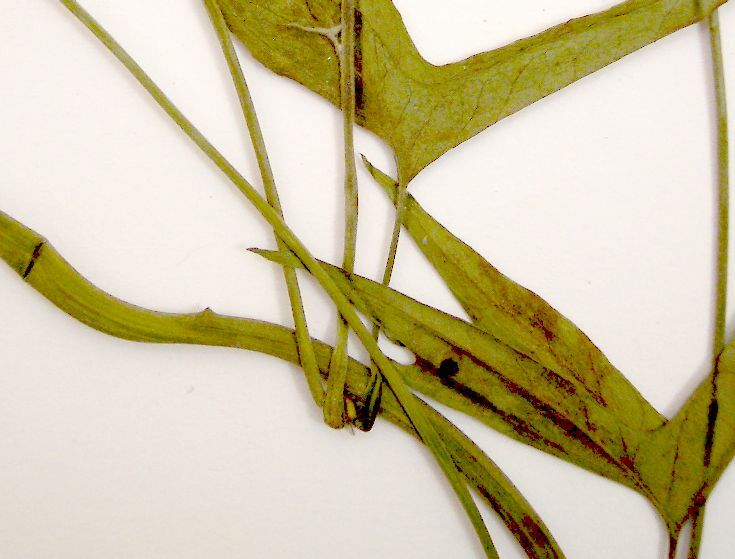 The Plant Atlas has been gathering specimens from 2003-2005, with the identification for each specimen verified by Jon Rebman. Thus this is a high-quality, uniform collection. Even better, it is searchable on the web. Note that more vouchers were collected in 2005, as the number of volunteers increased. However, it is strikingly clear just from the raw numbers that 2005 was essentially the only year with any significant number of ssp. "intermedia" vouchers! An amazing 80% (8 of 10) of the vouchers for ssp. "intermedia" were collected in the heavy rainfall period of 2005! Furthermore, those vouchers were collected entirely from 4 February to 19 April 2005. In contrast, only 42% (11 of 26) of the vouchers for ssp. 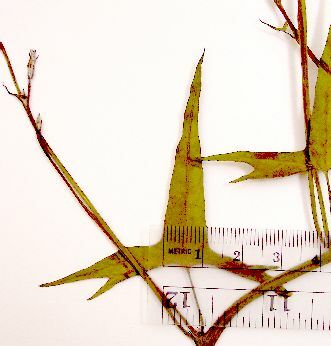 "tenuifolia" were collected during the entire year of 2005. Of those 11, two were collected in November 2005, well after the 2004-2005 rainfall season was over. Excluding those, only 35% (9 of 26) of the vouchers were collected during the same early 2005 period, from 17 February to 25 May 2005. As detailed above, this dramatically shows that 80% of the vouchers for ssp. "intermedia" were collected in 2005. This plot shows that in the drier years of 2003-2004, 65-75% of all vouchers were classified as ssp. "tenuifolia" and only 10% of all vouchers were ssp. "intermedia". In contrast, in the wetter year of 2005, only 40% of the vouchers were classified as ssp. "tenuifolia", and now 40% of all vouchers were ssp. "intermedia". Of course, the plants on average didn't change their subspecies in any of those years! Despite the small numbers, this difference is significant at roughly the 87% confidence level. I.e., if one claims that the true collection rate per year is the same for these two "taxa", in the rainfall season of 2005 one would expect that (8+9) / (10+26) = 17/36 = 47% of the vouchers to have been collected then. For ssp. "intermedia", the expectation would be 0.47 * 10 = 4.7 +- sqrt(4.7) taxa, whereas 8 taxa were found. This is a difference of 1.5 sigma, which occurs only 13% of the time by chance. This is pretty striking support for the hypothesis that there is no difference between ssp. "intermedia" and ssp. "tenuifolia", and that larger leaves are simply produced by more water. I've made the symbol for ssp. arida slightly larger so that its smaller number of locations could be more easily seen amidst the sea of the other "taxa". The plant from my yard that switched its leaf size is the most northwest location of ssp. arida. If it had been sampled by two independent observers in different years, it might well have been plotted twice, once as ssp. "intermedia" and once as ssp. "tenuifolia". In this plot, I've simply plotted each voucher at the center of its grid cell, since for some reason actual coordinates are not available from the public websearch. In the few cases where there were multiple vouchers of a given taxon from a given grid cell, I've dithered the positions so that both points can be seen. Note that there is absolutely no evidence for any geographic separation for the putative separate "taxa". Other floras corroborate the lack of geographic separation. For example, the Western Riverside County Checklist by Roberts et al reports that all three taxa are found in the same geographic area, with ssp. arida "common" and the other two "taxa" "scattered" or "scattered to common". The Plant Atlas data can also be used to plot the bloom periods for each of these "taxa". The bloom periods for these specimens show some very interesting trends, which confirm the bloom periods reported in Munz. In the wettest part of the year, typically January through April, most collections are ssp. "intermedia", with its big leaves. In the driest part of the year, July through November, all collections are ssp. "tenuifolia", with its small leaves. All collections of ssp. arida are from the transition period, April through June. This pattern is precisely what one would expect if one assumes that the division of these "taxa" was bogus. Plants with big leaves would be found in the rainy season; plants with small leaves in the dry season. In the transition between the rainy season and the dry season, plants with both kinds of leaves ought to be found. These plants can't be easily placed into ssp. "intermedia" or ssp. "tenuifolia", and hence are more likely to be identified as ssp. arida. Of course, the bloom period data are not proof one way or the other about whether the "taxa" are bogus or not. But given the solid evidence presented above that the "taxa" are bogus, it is certainly amusing to see how the expected variation in a single species plays out into parceling specimens of that single species into the bogus taxa. The simplest hypothesis that fits the data presented here is that ssp. "intermedia" and ssp. "tenuifolia" are bogus; they are not distinct from ssp. arida (s.l.) as originally defined. Instead, ssp. arida (s.l.) has smaller leaves when water is scarce, larger leaves with water is abundant, and its pubescence varies from being nearly glabrous to very-short-hairy. One of the supposed subspecies was already tossed by the Jepson Manual treatment. The claimed corolla distinctions were already tossed by the Jepson Manual treatment. The remaining discriminants for the surviving putative subspecies are ill-defined, and differ between the Munz and Jepson Manual treatment. The claimed geographic ranges for the supposed subspecies have also turned out to be erroneous, and there is no good evidence that any of the supposed subspecies has a geographic range distinct from any of the other supposed subspecies. My observations and vouchers of the same plant in two different years, with one voucher being a clear ssp. "tenuifolia" and the other voucher a clear ssp. "intermedia". My observations that ssp. "intermedia" is intermingled with ssp. "tenuifolia" in a given area, with ssp. "intermedia" found preferentially in the wetter areas in that area. The San Diego County Plant Atlas vouchers, which show that drier years preferentially produce plants with the characteristics of ssp. "tenuifolia", and that wetter years preferentially produce plants with the characteristics of ssp. "intermedia". These three independent sets of observations demonstrate beyond doubt that these taxa are bogus, with those forms being environmentally produced. As a result, I henceforth will refer to any specimen referable to any of these three "taxa" as the name with priority, ssp. arida, and recommend that all other botanists do likewise. GG. Bracts mostly rounded at base, firm and greenish. Mostly away from the coast..... ssp. arida. Jane Strong for many helpful discussions over the years about these taxa and many others.